‘The Grumpface’, is a poetic fairy-tale that tells the story of Dan, an inventor who ventures into a forest looking for a rose. Instead he is finds the mysterious Grumpface who threatens to hold him captive unless he passes some difficult challenges. What follows is a humorous adventure that neither Dan nor the Grumpface could have anticipated. 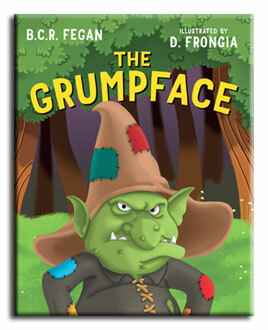 ‘The Grumpface’ is a tale in the spirit of any grand adventure. It is about a clumsy young inventor’s quest for love, and the challenges he must face to find it. But it is also a tale of bravery, absurdity and happiness, and the power of these qualities over negativity and sheer grumpiness. Was the Village of Hay, near the Forest of Ho. And get caught in a trap by that grumpy Grumpface. The Grumpface would have to let them go free. His frown with a smile, he’d stay a grumpface. Spreading his grump wherever he’d go. Our tale begins in a small village that sits beside a dark forest. Dan, the hero of our story is an optimistic, young inventor who suffers the unfortunate trait of being clumsy. Working day and night on his inventions, he hopes that his efforts might gain the attention of Bella, a flower girl whom he secretly admires. When it comes to his attention that Bella has no more roses to sell, he decides to brave the dark forest in order to find her one. The only problem, is that the forest is inhabited by a grumpy creature known as the Grumpface, and this creature is not known for his kindness to lost travellers. It doesn’t take long before our poor hero is confronted by the Grumpface who quickly challenges the young inventor to three tasks. If he is able to pass even a single challenge, he will be freed, if not, he will remain forever in the forest. Dan readily accepts the challenges and, having a bag of small inventions with him, tries desperately to put them to good use in each of the challenges. Unfortunately, the more he tries, the more spectacularly he fails. However all is not lost. Each time the clumsy inventor fails the task, the Grumpface struggles more and more to maintain his grumpy composure. As Dan fails his final task, the Grumpface can no longer contain himself. Dan’s clumsiness and clueless behaviour is too much for the Grumpface, and he can’t help but laugh. Surprisingly, this breaks the creature’s curse, and the Grumpface is transformed into an old man. In gratitude, he provides Dan with two welcome instructions – The first, is the way out of the forest. The second, is a small detour that will lead Dan to a single, red rose.